It’s 5 o’clock and you are wondering, “what did I accomplish today?” Maybe it’s even Friday and you are wondering about the week as a whole. Maybe you are thinking why didn’t I get anything done? There are so many ways to procrastinate. Check your email over and over all day. Start your day with email. Don’t make any decisions and leave everything in your inbox. According to research, we check email for as long a time as we binge watch a tv series. Not feeling up to getting the day started? Check on facebook, instagram, or pinterest to have a little fun. An hour slips by before you know it. Make everyone else’s priorities your priority. Their work is urgent and your’s can be on the back burner. Answer everyone else’s requests first. Jump from one task to another. Let’s start this project, move to another and another. Research shows multitasking appears and feels productive, but the results can show otherwise. It’s already 11 am. You’ve missed your best work time. Why get started now? Just take an early lunch. Don’t make a list for tomorrow. You can do that once you get in the office. There’s no time for a list and why decide on what’s tomorrow’s priorities. Don’t schedule in tasks. No need to set a time to accomplish a task when you can just do it when you’re in the mood. Schedule a lot of meetings, have no agenda and be sure to start late. It’s a great way to fill days without getting anything accomplished. You’re too busy to take care of yourself. Be sure to get in bed late, don’t make a meal plan or take time to rejuvenate. Put yourself last on the list. Never take a vacation. You’re too busy to take time off. You haven’t accomplished enough to take a vacation. 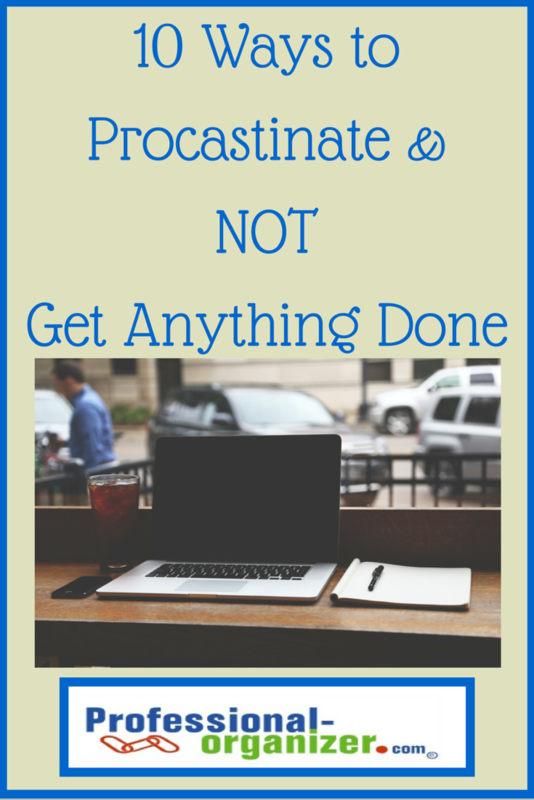 Maybe you have other areas you can procrastinate to add to this list too. Even with the best of intention and efforts, your organizing may not be making a difference. You may have tried many times to get organized, but for some reason your home is cluttered. 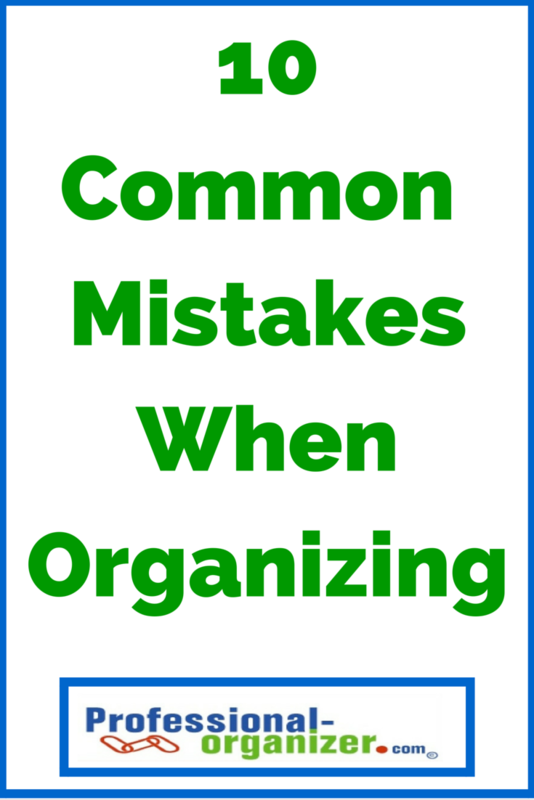 It may be that one of these common organizing mistakes is a problem. Check out these solutions for common organizing mistakes. Too often we jump into organizing and find we have made a bigger mess. Take a few minutes to think about what you would like your organization to look like, what you need most, and what routines will keep it organized. A little pre-planning makes all the difference. It’s not about having more storage. It’s not about having the right bins. Hold off from buying bins until you have worked through and decluttered your space. Then you are ready to decide on storage options. We start decluttering, get everything in a bag, and it stays at your entry or in your car for weeks. Make decluttering easy with an easy way to drop off your donations. Have a donation bag set up in your home for regular drop offs. The easier it is, the more you will donate. You start in one space and realize you need to bring stuff to another room. You head there and – oops – that space needs work too. Labeled as zig zap organizing, you will see the most success if you remain in and worn on only one space at a time. Place the stuff at the door with a post it note on it. Even the most organized home suffers when more and more is brought in to the space. Start an awareness of how much you purchase, why and when you purchase items. By creating a barrier to more stuff, you are able to establish organizing systems and routines. It can be surprising how much labeling a space makes a difference. Everyone knows where items belong and can put them away. Labeling keeps you organized. It’s easy to stash and dash. That’s when you get a new item but regretfully never put it away. Set up a daily distribution time to reset your personal and family organizing, put items away and put away the bags they came in. Keep your paper together. It sounds overwhelming, but keeping it in one spot helps you sort, recycle and keep the important papers. When paper gets spread out, all of a sudden it’s everywhere. Create one designated spot for mail to come to and sort. Triage it daily and work on your papers weekly. We don’t know what paper we might need to we keep it. We think we might use something, and we keep it just in case. It’s time to make a decision and decide what to eliminate. Basic questions to ask are these. When will I use it again? Do I have another good one? Would I purchase this again today? Don’t let indecision keep you from being organized. Organizing is hard work! Don’t go it alone! Gather up a team, whether it’s your family, church members, office colleagues or hired help. When you work together you make more progress and have fun too. 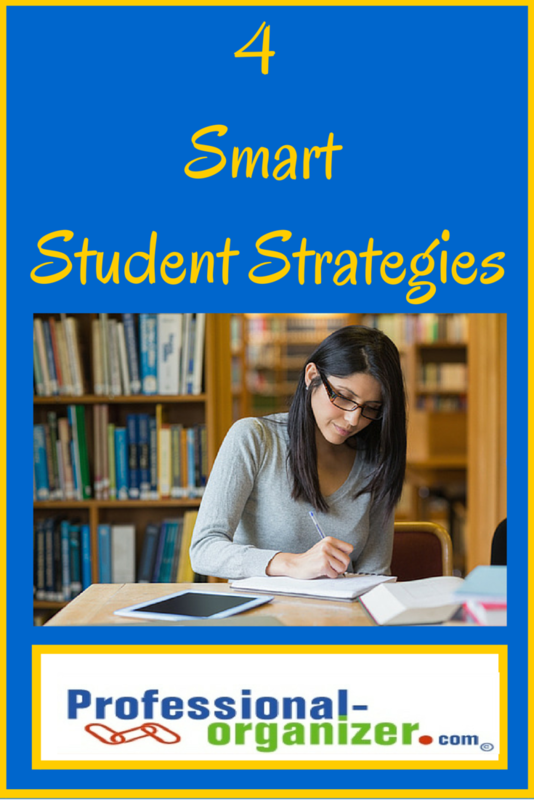 Are you struggling with getting organized? Post your question or problem here for a solution. 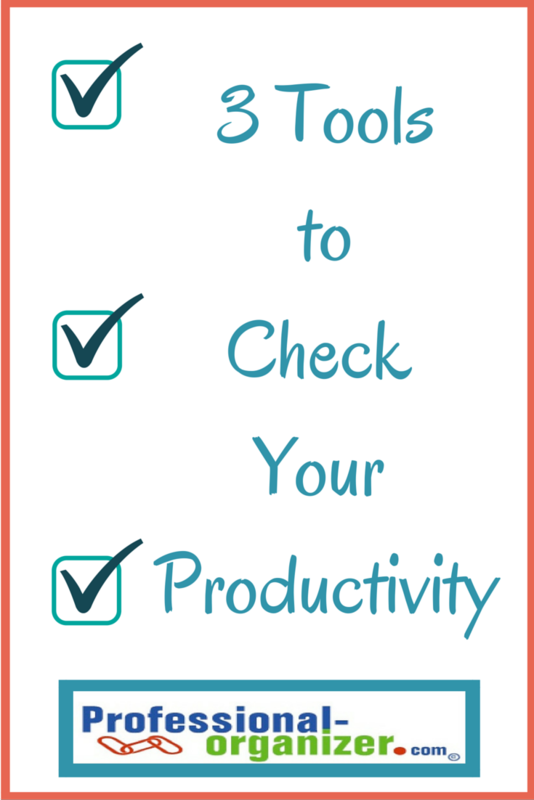 Join my newsletter for a monthly dose of organizing and productivity inspiration. Santas have been in Hobby Lobby since July. Orange and black fall decoration organizing bins just arrived at retailers. Should we celebrate Halloween first before jumping into the holiday spirit? As surprising as it seems, the best time to start your holiday organizing is now. There are some basic elements to the holidays that make it easy to organize now and enjoy the season. Year after year we follow many of the same holiday traditions. Why not start your lists now? Some easy to start lists are gift giving and holiday card lists. These lists are typically the same each year, however starting early gives you the opportunity to review, add and delete from these lists. An early start affords you time to break these lists into smaller chunks. Gift giving can be more manageable and even tweaked to become a gift of experiences. Holiday card lists include dates for picture taking, stamp purchases, addressing cards and then mailing. Getting an early start is one way to be sure you are ready when the holiday rush starts. The holidays are jammed with get- togethers. Focus on what’s most important to your family by talking about your holiday experiences. Reflect back and focus forward on what will be the highlights of this year’s holiday season. Get online early to purchase tickets for events, purchase airline tickets, and set calendar dates for what’s most important to your family. Simplifying your holiday experiences will make every experience more meaningful. Decorating for the holiday season can be overwhelming. It can be downright Grinch – like when families clash over Christmas trees and outdoor light displays. Start early with your holiday decorating. Take it room by room, inside and outside, or create family teams to tackle different spaces in your home. Take out your decorations early to see what you are ready to part with and ready to display. Giving yourself the gift of time to decorate can be one of the most fun parts of the season. You may still feel a little bewildered at this early start to holiday organizing. But year after year my clients reflect back that they wished they had started earlier on their holiday organizing. You can start organizing with your Pandora Christmas music playing in the background and your wassail simmering on the stove. 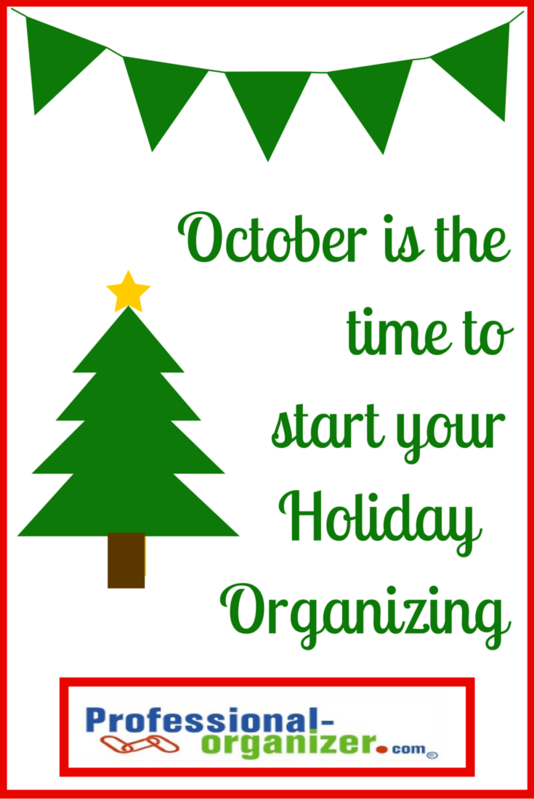 October is the best time to start your holiday organizing. Check out my pinterest Happy Holidays tips!